To the 3 posts above... of course. Regarding SP Arc: Okay maybe SoL fanbase wasn't the right term. I know what I'm talking about but I can't really put it succinctly. Whatever the case, the target audience of the Arc wasn't Index fans, that's for sure, even though Index and Railgun have a significant overlap. Regarding Plot Holes: I'm looking at it specifically from the perspective of Railgun-purists who completely disregard the Index anime and light novels and treat Railgun as part of its own universe. It happened in the Railgun manga forums on another site I go to; the dragon appeared and railgun manga only fans freaked out. Fans who were claiming that Railgun was better than Index due to Kuroko's (admittedly awesome) moment in the previous chapter got virtual egg thrown at their faces by cheering LN readers (such a great moment). This WILL happen again if there is another animation. I just can't wait for Railgun Volume 10 to be released by Seven Seas next year as it will generate interest in the Index series. Haimura (Index novel artist) released his sketches for Mitori and demon Mikoto. Mikoto confirmed to be Nuit. >"Note that Heaven is not a place where Gods Live; Nuit is Heaven, itself." >"Nuit cries: "I love you," like a lover; when even John reached only to the cold impersonal proposition "God is love." She woos like a mistress; whispers "To me!" in every ear; Jesus, with needless verb, appeals vehemently to them "that labour and are heavy laden." Yet She who can promise in the present, says: "I give unimaginable joys on earth," making life worth while; "certainty, not faith, while in life, upon death," the electric light Knowledge for the churchyard corpsecandle Faith, making life fear-free, and death itself worth while: "peace unutterable, rest, ecstasy," making mind and body at ease that soul may be free to transcend them when It will." >"Come forth, o children, under the stars, & take your fill of love!" (AL I:12). >"For I am divided for love's sake, for the chance of union." (AL I:29). >"I give unimaginable joys on earth: certainty, not faith, while in life, upon death; peace unutterable, rest, ecstasy; nor do I demand aught in sacrifice." >"Invoke me under my stars! Love is the law, love under will. So basically Mikoto is the Goddess of Love. Also, in level 5.3 pic. It's these kinds of things that remind you that Kamachi did a lot of research before putting together the Chuunibyou fantasy we call ToAru. On another note...Mikoto as the god of love. Let me laugh like a hyena. Kouzaku Mitori. I received a few different instructions such as giving her a nurse-like outfit, so she ended up like this. 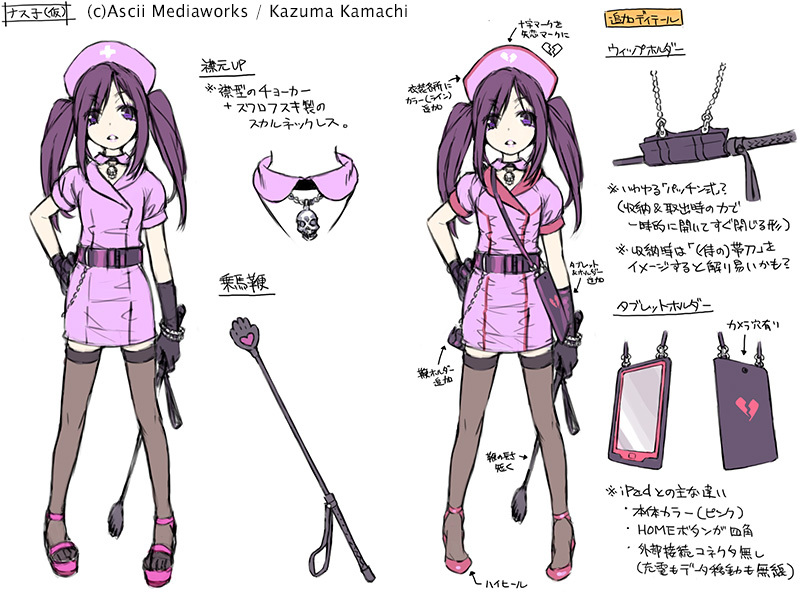 She’s kind of like I-No from the Guilty Gear series or a schoolgirl Shiina Ringo-san. I may have also viewed her as a more offense-oriented Shirai Kuroko. Rail-Gun: Level [Phase]-Next part 1. Pretty much exactly like a transforming final boss from a JRPG. Form 1 and 2 borrowed elements from fictional beings classically associated with lightning. Rail-Gun: Level [Phase]-Next part 2. Some changes made and details added since part 1. By the way, the names here were added by me and are not official. Rail-Gun: Level [Phase]-Next part 3. An eeriness created by no face (expression), a vague form, taking the forms to their extreme, and all excessive decorations or complicated shapes removed for a sudden minimalism. To go back to the JRPG origin, this is like Lavos Core, Ozma, or Yu Yevon. Do you get what I mean? 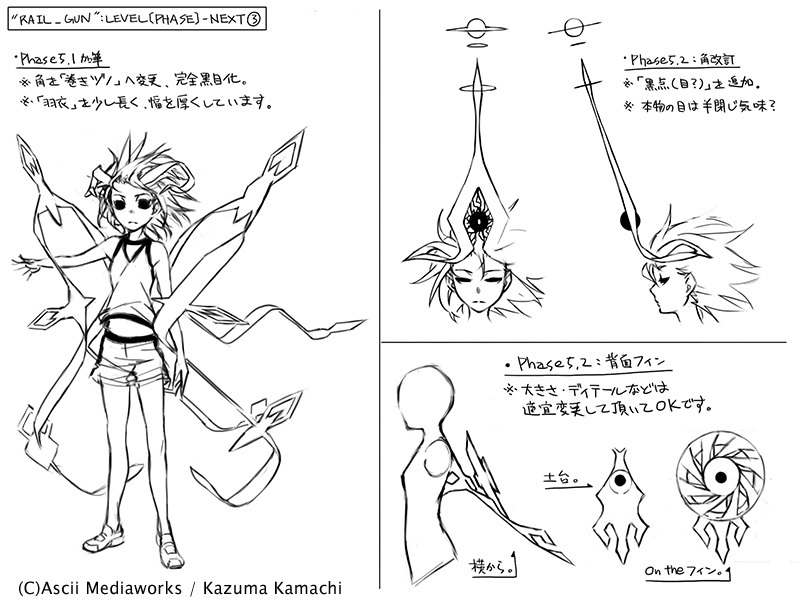 As for the Mikoto = Nuit, that theory existed since the day 1. of her final transformation. But I believe it's not actually goddess of love, but rather Egyptian sky goddess. Considering Aleister's involvement in ESPer stuff, we can relate to the Thelemite gods. Aleister even calls Nuit "Electric Light" in the Book of Law. aeon of horus and aiwass's relative?? 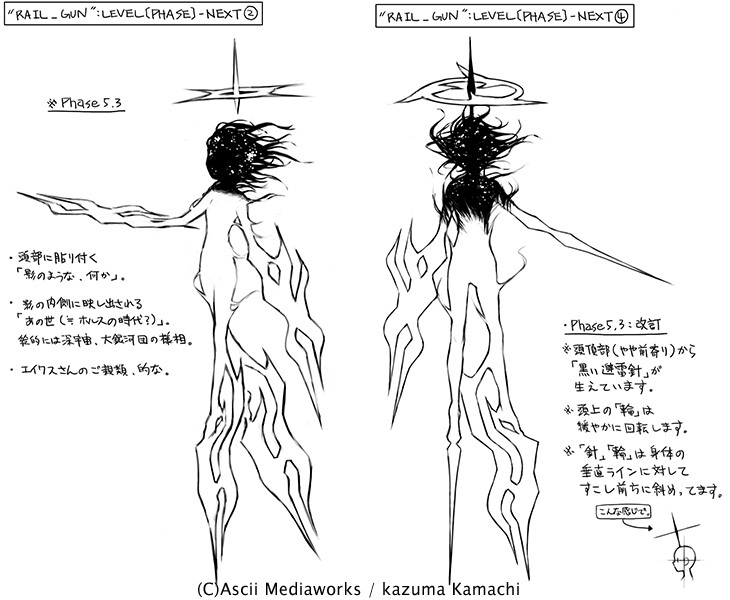 wouldnt that mean that lvl6 is something like aiwass?? 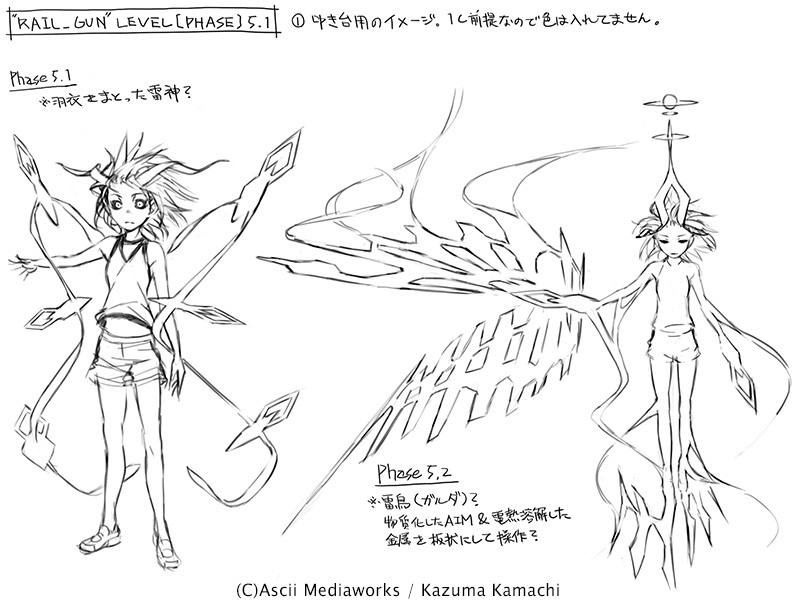 level 6 is probably the realm of Horus because they are using different method of attaining godhood from magic side. IF we BELIEVE what Aleister is saying or his motives are saying then the correct method is science and science is better than magic. But if you ask me. Aleister's method isn't pure science. Its more like magic science combine with the magic elements ingrained in the science method. Aleister is just viewing the world in different way than the magicians and using different method but the goal is probably the same. So another theory posted here? Well, isn't different to the one posted about Kakine and Accelerator in the old LN thread. Just fans running their mind wild . Last edited by dniv; 2014-05-14 at 19:10. And Mikoto always seemed like she was being set up as important. She just wasn't, you know... #1, since Index was the title character and all. Just reading through the wikpedia page and this little bit jumped out at me. Within this system, she is one-third of the triadic cosmology, along with Hadit (her masculine counterpart), and Ra-Hoor-Khuit, the Crowned and Conquering Child. She has several titles, including the "Queen of Infinite Space", "Our Lady of the Stars", and "Lady of the Starry Heaven". Nuit represents the infinitely-expanded circle whose circumference is unmeasurable and whose center is everywhere (whereas Hadit is the infinitely small point within the core of every single thing). According to Thelemic doctrine, it is the interaction between these two cosmic principles that creates the manifested universe similar to the gnostic syzygy. Perhaps Alistars plan involves making this triad true? If you want run your mind wild think again what you bolded. However those lines are too common.